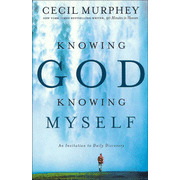 Author Cec Murphey understands that we’re busy; he also understands that we NEED to know God–intimately. As a result he has put together a deep but simple daily guide to developing and maintaining a close and ongoing relationship with our Creator. In daily “sound bites” that we can all squeeze in to our crowded days, we find personal insights from a man who has spent many years cultivating that personal relationship with God, and we are challenged to do the same. Highly recommended! To order this book and/or to learn more about this prolific author and popular speaker, please go to http://themanbehindthewords.com/.